The positive Cabinet meeting outcome supported GBP. The news going on over the Brexit issue along with the UK’s Brexit minister David Davis resignation will influence GBPPUSD as well. 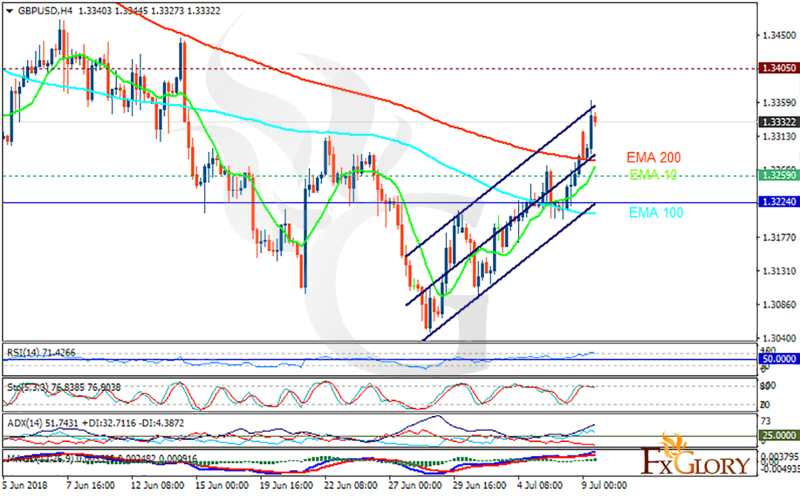 The support rests at 1.32590 with resistance at 1.34050 which both lines are above the weekly pivot point at 1.32240. The EMA of 10 is moving with bullish bias in the ascendant channel and it is below the EMA of 200 and above the EMA of 100. The RSI is moving in overbought area, the Stochastic is moving in high ranges and MACD line is above the signal line in the positive territory. The ADX is showing an upward trend. While considering pullbacks on the way, GBPUSD will grow towards 1.345.